Welcome to Dinar Daily Discussions. Logging in with your USERNAME allows you to participate in discussions, see what has recently been posted, and other options. Guests can post but they do have limited abilities. We are NOT a guru forum. We are a dinarian forum. The opinions expressed on the forum do not reflect the of opinion of Dinar Daily specifically, but rather reflect the views of the individual posters only. We are in compliance with, "Copyright Disclaimer Under Section 107 of the Copyright Act 1976, allowance is made for "fair use" for purposes such as criticism, comment, news reporting, teaching, scholarship, and research. Fair use is a use permitted by copyright statute that might otherwise be infringing. Non-profit, educational or personal use tips the balance in favor of fair use." 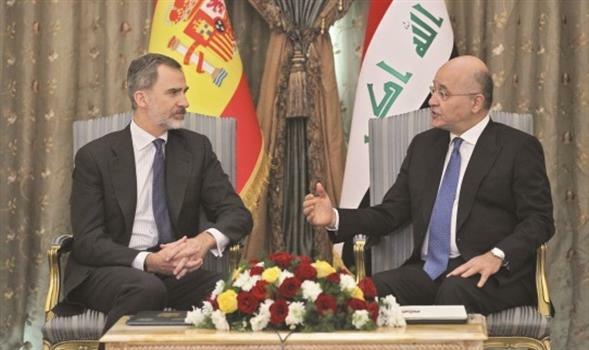 The President of the Republic Barham Salih received on Wednesday, King of Spain Felipe VI and his accompanying delegation in the capital Baghdad. This is the first visit of the King of Spain to Iraq 40 years ago. BAGHDAD (Reuters) - Spanish King Felipe VI on Wednesday paid a visit to Baghdad, the first Spanish monarch in four decades, to visit special forces in the country, a diplomatic source said. During his meeting with the Iraqi president, King Felipe said that Spain is keen to consolidate friendly relations and expand the horizons of constructive cooperation between the two countries and expressed admiration for the steadfastness of the Iraqis and their sacrifices in the face of terrorism. For his part, Saleh hailed the "depth of historical relations between the two countries and the need to consolidate them to serve the common interests of the two peoples and that Iraq seeks to develop its relations with its regional and international environment to enhance its status and role in the region." Saleh said «Spanish government to contribute effectively to the construction movement in Iraq Because of its role and its active participation in the war against gangs. " The Spanish news agency «AVI» said earlier in the day that King Felipe VI arrived in Iraq to inspect Spanish troops deployed there. The Spanish king traveled to Iraq with Spanish Defense Minister Margarita Robles on an undeclared visit for security reasons to coincide with his 51st birthday, the agency said. Spain, which participated alongside the United States in the invasion of Iraq in 2003 to topple the regime of Saddam Hussein also participates in the number of soldiers in the International Coalition against jihadists. After the coalition support for Iraqi forces in defeating the Islamic state from the urban areas in Iraq, the advisers and military trainers present in Iraq, including several hundred Spaniards. The visit of the King of Spain, in the framework of diplomatic activity intensive in Baghdad since the beginning of this year. After the visit of US President Donald Trump to US soldiers in Iraq without meeting any official, Jordanian King Abdullah II visited Baghdad for the first time in 10 years. The visit of Abdullah II coincided with a visit to the French Foreign Minister Jean-Yves Laudrian amid diplomatic movement including the Foreign Minister Iranian President Mohammed Javad Zarif, following a similar visit by US Secretary of State Mike Pompeo. During all these meetings in Baghdad, the issue of the organization was raised in the wake of Trump's sudden decision to withdraw 2,000 US troops based in Syria. The majority of the international coalition forces are in Iraq and intervene in occasional strikes in Syrian territory along the desert border with Iraq. » Poll - Do you think the Iraqi Dinar will actually RV? » POOFness for APR 18: Medicine & Lights Yeah I have not used that one for awhile... might fool the gullible! » Adam Montana says - The goal, as stated by all reports, is to get affairs in order quickly. » Guru Kaperoni believes the CBI needs to accept the conditions of IMF Article VIII to allow freedom of movement of capital. » Guru Walkingstick says -- THERE IS NOTHING FROM STOPPING IRAQ FROM ADDING VALUE TO THEIR CURRENCY. » The Association of Private Banks organizes a course on "Developing the Skills of Taler Employees"